[WSO2Con Asia 2018] Are You a Software Company Yet? Are You a Software Company Yet? Sanjiva is the Founder, Chairman and Chief Architect of WSO2, where he leads the design, architecture and development of Ballerina. After starting WSO2 in 2005 and as its CEO for 12 years, Sanjiva lead the creation of a complete set of middleware products before deciding to throw them all away and start again with a programming language approach. Prior to starting WSO2, he was at IBM Research where he led the development of Web services standards and technologies. He's a long time open source developer and advocate and is a Member of the Apache Software Foundation, an Emeritus Board Member of the Open Source Initiative and Founder and Chief Scientist of the Lanka Software Foundation. 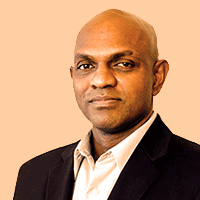 He also volunteers in the Sri Lanka Army where he serves as the IT advisor. He received a Ph.D. in Computer Science from Purdue University in 1994.